The Viaur Viaduct (1902) is a bridge on the railway line between Castelnaudary and Rodez. It crosses the deep valley of Viaur between Rodez and Albi and is located in the towns of Tauriac-de-Naucelle (Aveyron) and Tanus (Tarn). 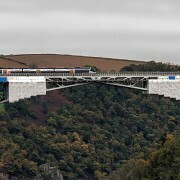 This bridge is the subject of a registration as a historic monument. The bridge was in need of asbestos removal and for his work, Javer’s shrink-wrapped film was used. The Cathedral Basilica of Our Lady, or simply Amiens Cathedral, is the largest church in the French city of Amiens, the administrative capital of the Picardy Region. It is the tallest gothic cathedral in France and belongs, along with the cathedrals of Chartres, Reims and Bourges, to the purest examples of gothic architecture. Since 1981, Amiens Cathedral has been listed as a UNESCO World Heritage Site. 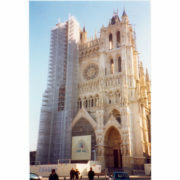 The Cathedral was renovated using Javer’s scaffolding nets Type 120. The Louvre is one of the world’s largest museums located in the 1st arrondissement of the French capital Paris. It is located just north of the Seine. It consists of three wings: the Richelieu wing, the Sully wing and the Denon wing. The museum belongs to the Réunion des musées nationaux et du Grand Palais des Champs-Élysées. For years, it has been world’s most visited museum. 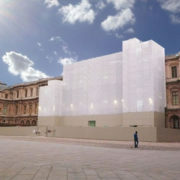 The Louvre underwent sandblasting works whereby Javer’s sandblasting net type 500B was used.